Getting through cold, dark winters can be difficult for anyone. With CRPS, we understand that there can be more complications. As someone with CRPS, I’ve fought through some of the darkness of winter with music. Get on board with me and see what my recommendations are to get you through to Spring! Winter can be incredibly difficult for people with CRPS. All through the United States, we’ve been facing some crazy weather. There has been snow in places that it doesn’t snow, temperatures lower than Alaska in the Northeast, and overall low temperatures all over the country. This weather can make us feel less than stellar. With snow and ice, it can be hard to get around, especially with lower body CRPS. Shoveling can be impossible for us. The cold overall can make our pain feel worse. So many of us are counting down until Spring, when it isn’t freezing, but also isn’t too hot. We need something to keep us in an upbeat mood to beat those winter blues. I wrote an article like this before and it was well received. Call me DJ Sammie-Ay, because I’m writing up all of the song that I think will help you and CRPS through the winter! Music is proven to boost moods. If your body can’t handle vibrations from playing music on a radio or speaker, try headphones on a low volume. These songs will help lift those spirits and will help Spring get here before you know it! Take that, CRPS! “Can’t Stop the Feeling” by Justin Timberlake. This song is the feel-good anthem of 2017 and I’m carrying it over to 2018. It’s an upbeat song all about positivity. We’re keeping sunshine in our pockets. This song came from the Trolls movie, which I highly recommend for anyone looking for a happy movie to lift their spirits up (available on Netflix right now). You can’t not smile when you hear this song or see those goofy trolls on your screen. “Sorry Not Sorry” by Demi Lovato. While this song is about telling off an ex and telling them what they’re missing, it is a fun song. We can be “sorry not sorry” for a lot of things in our life. I’m happily married and sing this at the top of my lungs. I’m “sorry not sorry” for the days I’d rather stay in watching Netflix versus going out into the cold, for the days I have to choose myself over others, and for being who I am. I am a woman with disabilities that refuses to apologize for it. Sing it with me, baby I’m sorry I’M NOT SORRY (listen to the song, you’ll see why that was in all caps). “The Champion” by Carrie Underwood feat. Ludacris. We work hard every day to get through. We may get knocked down from time to time, but we get back up, fight back hard, and train every day to make our comeback. This is an interesting song from Carrie Underwood and is nothing I’m used to hearing from her. Through this song, she makes me feel unbreakable and unstoppable. When we come out on the other side of winter, we will all be the champions! I also happen to like Ludacris’ breakdown of what each letter in champion stands for. Take a listen. You’ll feel like you can never lose! “Rewrite the Stars” by Zac Efron and Zendaya. This song is from the new movie The Greatest Showman. This is a slower song with a good beat behind it, which seems like a huge contradiction. It’s really just a beautiful song. It sounds like a bit of a Romeo and Juliet story within a song, trying to rewrite how life is supposed to go. It’s just a great song to get lost in. “Walking on Sunshine” by Katrina and The Waves. This song makes it nearly impossible to have a frown on your face. It’s so upbeat and catchy. I could be in the worst mood and someone would put this song on and I’d have to laugh and sing along. This is a great song to have in your library. It’s my “In Case Of Emergency” fun. Also, if you use Spotify, this is a part of the “Have A Great Day!” playlist, which I highly recommend. The songs are all just too good! We’ll all be walking on sunshine once Spring is here, so let’s prepare by singing along. “Finesse (Remix)” by Bruno Mars feat. Cardi B. Now, I do not like Cardi B. But this song sounds fresh out of the 90s. It sounds like Boyz II Men, Fresh Prince, and TLC combined. It’s a feel-good song. You can’t help but bob your head. If you love 90s music still, this needs to go to the top of your playlist. I can’t find any faults with this song, despite not liking one of the artists. You’ll absolutely smile with this song. “Smoke Clears” by Andy Grammer. This song is nice because it talks about how there are lows in life, but there are brighter days ahead, also known as when the smoke clears. The amazing things about the CRPS community is that everyone is supportive of one another. We will all always support each other and help each other through the tough times to the better days. So, I’d like to consider this to be an anthem. Instead of Andy Grammer singing it, imagine the entire CRPS community singing it to you. Talk about powerful! “Love Myself” by Hailee Steinfeld. This newcomer has a great voice. This song is fun and is all about how putting yourself first and loving yourself. It is upbeat. This can help usher you into Spring. Make yourself happy and all will be well. It’s also a great little jab at anyone that isn’t 100% supportive. Take that haters! “Your Song” by Rita Ora. This song is great. It is the ultimate anti-sad song. While it is a little provocative (warning), Ora sings about how she doesn’t want any sad or angry songs any more, just happy songs and love songs. There is a fun little beat in the background. Bonus fact: This song was written by Ed Sheeran. “Happy” by Pharrell Williams. This song was from a kids’ movie, but took the world by storm a few years back. This song is all about being happy and getting happy. He sings about how nothing can bring him down, and with this song in your playlist, nothing can bring you down either. Even if you can’t clap along, you’ll get the idea. “Don’t Stop Believin’” by Journey. This is a classic that can be on any playlist. It’s a great song and a great reminder to keep believing in tomorrow. Days get better, company gets better, and seasons get better. We’re getting closer and closer to spring with each passing minute. You’re even closer to spring now than you were at the beginning of this blog, so keep believing. That’s enough for today. 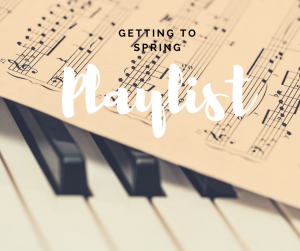 Add these songs to your playlists on iTunes, YouTube, or Spotify and listen to them until Spring comes. I have a playlist for every mood and every season, so if you like this blog, be sure to give it a thumbs up on Facebook and let us know if you want more! Take that, CRPS!